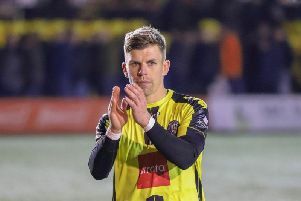 Warren Burrell has played every minute of every Harrogate Town fixture this season and that record is one that he is proud of. The versatile 28-year-old has been a key part of the club’s push for a second successive promotion, operating at right-back, centre-half and left-back during his 45 appearances to date. And despite having to occupy one or two unfamiliar positions, Burrell has performed consistently well throughout the club’s debut season in the National League. “I’ve always been quite a fit guy and versatile on a football pitch, which obviously helps,” he said of his ever-present campaign. “The fact that I’ve played every match shows consistency in my own game and that I must be doing something right. Burrell has spent almost his entire career as a midfielder, but was moved to the centre of the Town defence by Simon Weaver during 2017/18. He’s remained a regular starter at the back ever since and says he has no problem with being deployed in a defensive position. “I’ve been a central midfielder all my life, but to be honest, I really don’t know what my best, or my favoured position is any more,” the former Mansfield Town man added. “I was moved to centre-half last season and enjoyed it. This year, going to left-back has been a challenge because I’ve never played there before, but the principles of defending are just the same. “It doesn’t matter where you’re playing across that back-four you just need to try and defend your goal and stop the other team from scoring. As well as adapting to the switch into defence, Burrell has also had to deal with the step up to National League football this term. “As a team I think we’ve taken it in our stride,” he said. “There was no real expectation at the start of the season, we just wanted to do the best that we could.